The Atlantic waves were crashing in to the Icebergs stranded along the south shore. I couldn't believe the power! After being nearly hit with an iceberg as I tried getting a shot, I set up to get this shot. Waiting for the perfect wave, I dodged another couple of icebergs before a large wave built high enough to challenge the massive iceberg standing among the breakers. 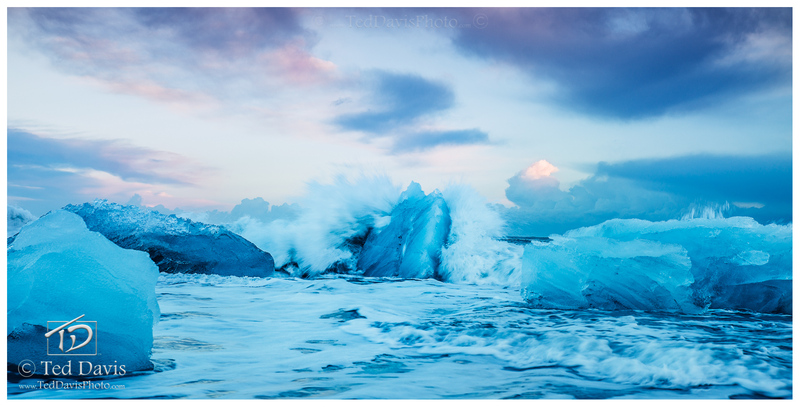 Snapping quickly, I had the shot - pure Northern Might as the iceberg stood against the crashing waves. Photo © copyright by Ted Davis.